This was a fairly inconsequential issue of DETECTIVE COMICS that I bought in the little candy store next door to my barber’s office. It’s another one where I didn’t recall any of the details of the lead story until I cracked it open again today. The Rich Buckler cover is all right, decently dramatic, a step up from the typical Ernie Chua/Chan fare, but still weakly inked by Vince Colletta. It’s also an almost quintessential mystery/question cover: why are there two Batmen? Which one is the real one? And why are they fighting? Unfortunately, the answers aren’t as interesting as the questions in this instance. The story does have one interesting wrinkle: it opens up with a shadowy figure surprising Batman as he returns to the Wayne penthouse following a successful night’s patrol. 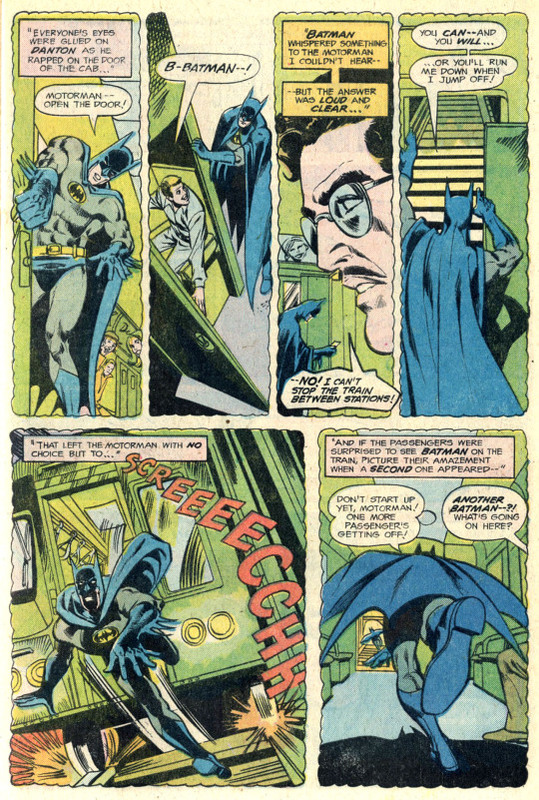 Writer Bob Rozakis makes a guessing game out of the identity of Batman’s mystery visitor, but he’s somebody that the Caped Crusader doesn’t mind unmasking in front of, and who comes from out of town. 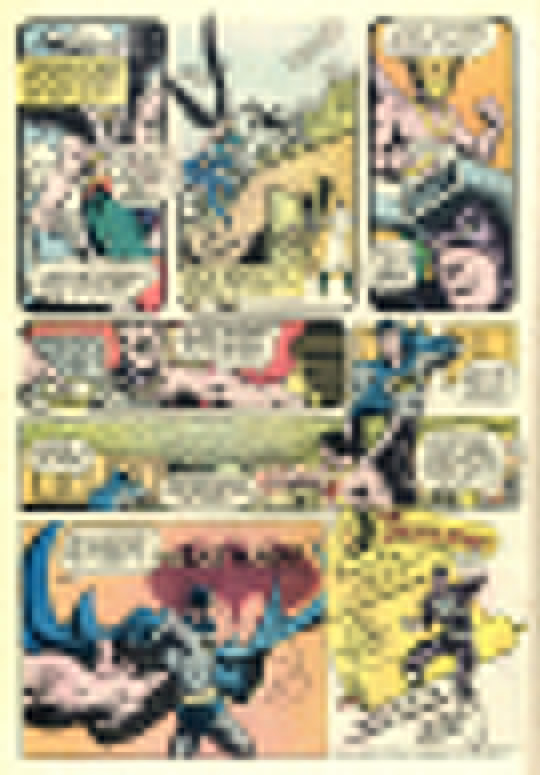 As they wait to eat breakfast, the visitor asks Batman about his night, which segues into a recounting of events, starting with Batman adopting his persona of Matches Malone to tail a pick-up man for a gambling ring. 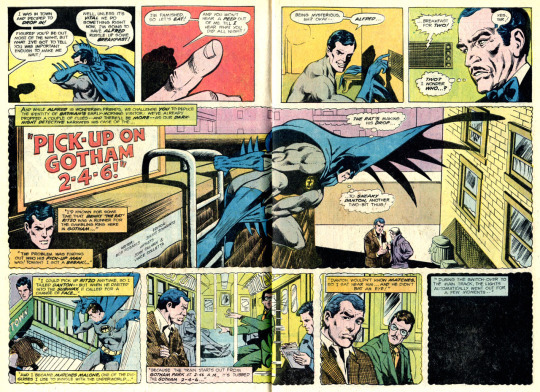 Batman is surprised when the pick-up man disappears, only to resurface a moment later clad in his own Batman costume. 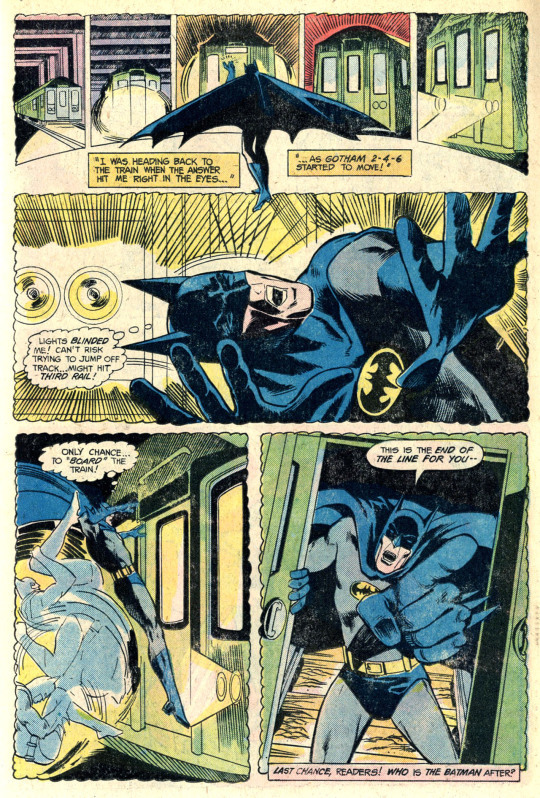 Matches tails the faux-Batman as he makes his way to the conductor car and stops the train, disappearing into the subway. Putting on his own costume, Batman gives chase. The two Batmen play a game of cat-and-muse in the tunnels, eventually ending with the fake stumbling into the electrified third rail and being killed by the current. But when searched, the pick-up man didn’t have the parcel he was delivering, meaning that he’d handed it off to a confederate back on the train. But who? …Hawkman! He’s come to Gotham City following his own latest adventure, an adventure like the others that had been running throughout the back pages of DETECTIVE COMICS for several issue, in which a different hero would battle the recurring villain The Calculator. 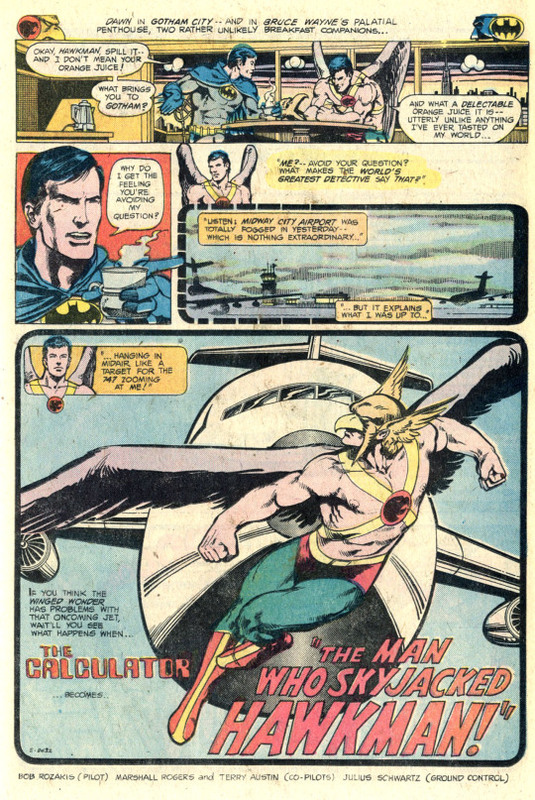 The adventure started with Hawkman rendezvousing in midair with a 747 in order to pick up an atomic scientist needed in Midway City to prevent a meltdown at the energy plant. But rather than the doctor, Hawkman wound up getting the Calculator instead. 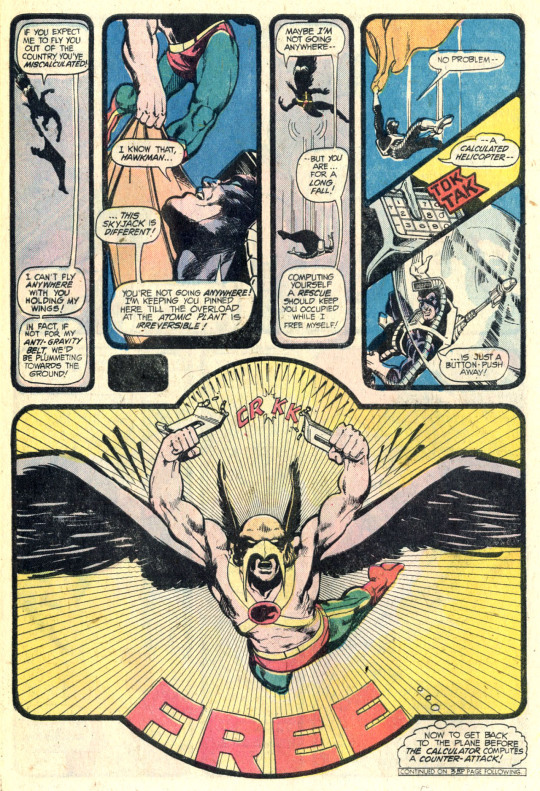 Te rest of the story is mostly a midair battle between Hawkman and the Calculator, excitingly drawn by newcomers Marshall Rogers and Terry Austin. I’ve been told that there were some up at DC editorial in this period who didn’t think Marshall was ready to be doing comics for DC yet, but this story is so much more engaging and dramatic and interestingly-paced than the lead Batman tale that you almost need to wonder if those editors were blind or merely stuck in their own preconceptions. Yes, the pages are sometimes crowded, and the anatomy can get a bit wonky. But there’s such an energy and a power to Marshall’s work that it makes up for those deficiencies. Either way, Hawkman is able to get the upper hand over his foe, but he’s forced to leave the Calculator in the wind in order to get back to the 747 and the doctor in time to prevent that reactor meltdown. And again, the Calculator manages to punch his special key when Hawkman defeats him, immunizing him to any future aggression from the winged wonder. Back in the present, based on nothing more than intuition (and the fact that the writer and editor know what’s coming next issue) Hawkman has winged his way to Gotham to warn Batman that he’s certain that the masked manhunter will be the Calculator’s next target. 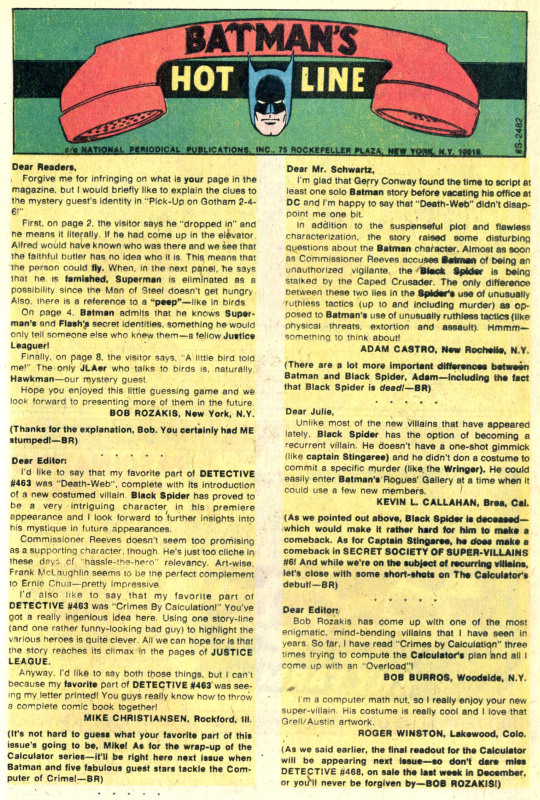 Finally, on the Hot Line letters page, “fair play” Bob Rozakis takes a few moments to explain and clarify all of the clues he dropped as to Hawkman’s identity in the opening story.